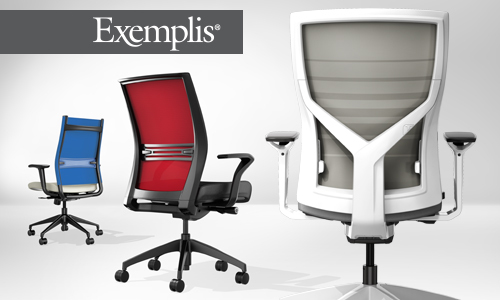 Exemplis® (“Exemplis”) was founded in 1996 in Orange County, California with the goal of providing outstanding design, comfort and value in office seating. Its trusted brands include market share leader SitOnIt® Seating, and IDEON® lounge seating and tables. SitOnIt® Seating is a market leader in high quality, high design, comfortable, and affordable office seating. SitOnIt® Seating build-to-order products are manufactured in southern California for timely shipping in as little as two days. SitOnIt® Seating is a brand of Exemplis Corporation, a leading U.S. designer and manufacturer of built-to-order furniture. Exemplis is headquartered in Cypress, California. IDEON® lounge seating and table collections are designed for education, healthcare, hospitality and office environments. IDEON® delivers high-quality, stylish lounge seating affordably and quickly, with an industry-leading 10-day turnaround time. Timely shipping and the flexibility of a build-to-order business model has revolutionized the way furniture is specified. IDEON® is a brand of Exemplis LLC, a leading U.S. designer and manufacturer of build-to-order furniture. Exemplis is headquartered in Cypress, California.